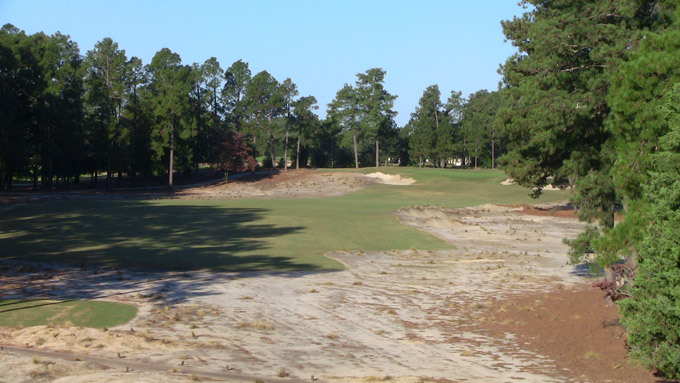 Bill Coore and Ben Crenshaw have dramatically revived Pinehurst’s lost primitive look. 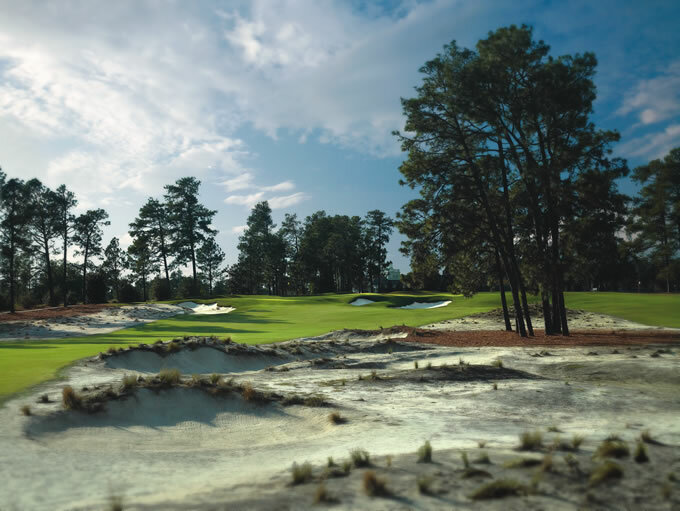 It’s impossible to talk about Pinehurst No. 2 without talking about the big convex greens. And it’s hard to talk about the greens without recalling Pete Dye’s old yarn about how they got the way they are. Dye played the No. 2 course weekly while stationed at Fort Bragg in the 1940’s. The greens then were not particularly crowned — they were robustly contoured Ross greens with rolling movement around the turned up shoulders. But about this time they began to grow higher at the center, less at the edges, due to aggressive seasonal topdressing. Dye estimates they’d grown a foot or more on average by the time he returned in the late 1950’s or early ’60’s, but by then they’d become revered as an integral part of the design, even though Donald Ross never intended them to look like that. Today, of course, we identify those morphed greens as the source of No. 2’s greatness, a happy accident of evolution; in The Confidential Guide, Tom Doak writes that the green complexes are the best he’s seen. It’s not only their unique shapes that set them apart but also how they’re arranged in relation to the approach shots and their ground-level surroundings. From 80 yards in, Pinehurst No. 2 is the easily one of the most demanding, even frightening course I’ve ever played. A round here is a psychological and physical exorcism that measures your cerebral, muscular and emotional control, at least if you’re trying to make pars. To place short shots in the appropriate position on the greens you have to correctly calculate spin, trajectory and roll. Then you must execute the shot, usually from tight lies, with supreme confidence because imprecise hits won’t hold the greens. From day to day and hole to hole, the margin for error can be so thin that invariably you’re going to mis-hit or miscalculate, and when you do you’ve got to accept the disappointment. Watching your ball roll off the edge of a green again and again, sometimes on the same hole, can lead to panic — I know I’ve never felt so nervous hitting basic chips and pitches, and even putts, as I have here. No. 2 can get inside your head. A few years ago the resort hired Bill Coore and Ben Crenshaw to restore the old sand and wire grass borders to the holes, returning No. 2 to more of the way it looked and played when Ross knew it. In doing so, they’ve addressed No. 2’s primary weakness: the play off the tee. This pre-Coore and Crenshaw shot of 11 shows how the rough had taken over the shape of the hole. 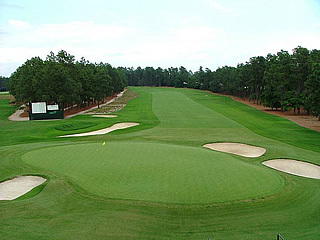 Over the decades the grass roughs had slowly — or sometimes suddenly due to ill-advised changes — filled out the edges of the holes from the treeline in to manipulate the shape of the holes. In the last 20 years the mowing patterns had gotten narrower and narrower, dumbing down the tee shots to simple exercises in accuracy. Like Augusta National, the greens are best approached from a variety of angles depending on the pin setting, and that flexibility had been forsaken. Ross always had it right structurally and there are really no weak holes — that would be almost impossible with these greens. The par-3’s, playing to different lengths and green orientations, are under-appreciated with the 165-yard 9th being one of my favorites anywhere. I don’t think the 15th gets proper attention either. You occasionally hear visitors say they don’t love No. 2, and other than the normal comments about it not being exciting enough (that changes with the restoration of the sand borders) I think a lot of that has to do with price, which can border on the outrageous. For the same money or less players can go to Kiawah’s Ocean Course or play several rounds at Bandon Dunes where there’s no ambiguity about the excellence, and awesome ocean scenery to boot.